Harvard-led team is the first to demonstrate the ability to use low-power light to trigger stem cells inside the body to regenerate tissue, an advance they reported in Science Translational Medicine. The research, led by Wyss Institute Core Faculty member David Mooney, Ph.D., lays the foundation for a host of clinical applications in restorative dentistry and regenerative medicine more broadly, such as wound healing, bone regeneration, and more. A number of biologically active molecules, such as regulatory proteins called growth factors, can trigger stem cells to differentiate into different cell types. Current regeneration efforts require scientists to isolate stem cells from the body, manipulate them in a laboratory, and return them to the body — efforts that face a host of regulatory and technical hurdles to their clinical translation. But Mooney’s approach is different and, he hopes, easier to get into the hands of practicing clinicians. Since the dawn of medical laser use in the late 1960s, doctors have been accumulating anecdotal evidence that low-level light therapy can stimulate all kind of biological processes including rejuvenating skin and stimulating hair growth, among others. 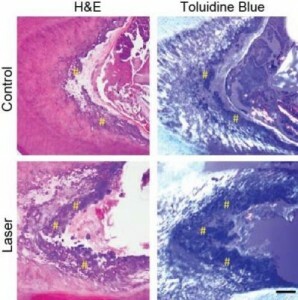 But interestingly enough, the same laser can be also be used to ablate skin and remove hair — depending on the way the clinician uses the laser. The clinical effects of low-power lasers have been subtle and largely inconsistent. The new work marks the first time that scientists have gotten to the nub of how low-level laser treatments work on a molecular level, and lays the foundation for controlled treatment protocols.